Election day is rapidly approaching…less than three months away. Early voting starts in just 67 days. As we get closer to election day we’re going to be reaching out to our supporters even more to talk about ways to help this campaign win in August. One way to help is to host a meet and greet with your friends and neighbors. Scheduling is really easy. 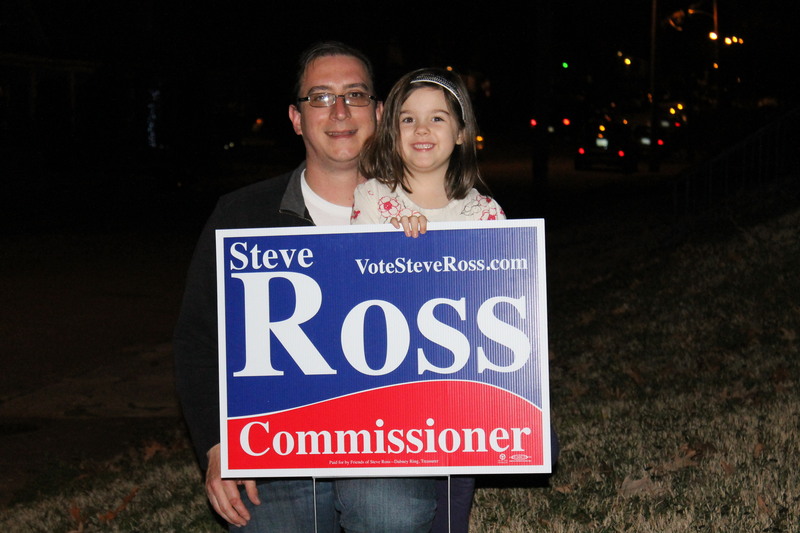 Just send an email to info@votesteveross.com and we’ll get the ball rolling. Of course, we’re still accepting donations and help from volunteers. With your help we can make Shelby County stronger. Election day is less than 100 days away. August 2nd is going to sneak up on us before we know it. Since January we’ve been blessed to have a handful of dedicated volunteers helping with all kinds of things, from canvassing and delivering campaign signs to making calls. Thanks to the efforts of these dedicated individuals, we’ve been able to reach out to people all over District 1 that we might not have been able to otherwise. As election day approaches, it is critical that we step up our efforts to reach out to voters. Volunteering just a few hours a week will go a long way to helping meet our goal. If you’re interested in finding out about ways you can volunteer with the campaign, use the contact form with the subject volunteer to find out more. If you’re ready to get started, head over to the volunteer page and fill out the form. Someone from the campaign will get in contact with you in the coming days. If you just don’t have the time right now, consider making a donation to help support the campaign. Running a winning campaign takes a group effort. Together, I feel confident we can win in August. Thank you, and I look forward to hearing from you. 1. We needed a new tone in County government…one that seeks to unite us rather than exploit longstanding divisions for short-term gains. 2. Local government has not effectively exercised long-term fiscal discipline, accountability, or transparency, which has lead to a crushing debt, low population density, and diminishing revenues that threaten the stability of County government. 3. In order to grow stronger as a community, all the stakeholders in the county must work together for a common cause: the growth and revitalization of our county. This means building a better educational system, effectively combatting poverty, blight and crime, and working hard to create an environment that attracts investment from outside our borders as well as local entrepreneurship. While these areas paint with a broad brush, I think its important to understand where I’m coming from, where I stand, and what I intend to do if elected. I’ll be doing more of this as the campaign continues. Since announcing, I’ve been fortunate enough to have a lot of people help get that message out. There are a million ways to communicate with people and one of the hardest things for any organization to do is not just reach your audience where they are, but get and hold their attention. I appreciate all the help I can get. • We’ve had over 125 people join the Facebook page in the past few months. • Hundreds have signed up for emails from the campaign. • Our volunteer base has been growing steadily since early January. • Friends of the campaign, Trace at Newscoma and Steve Steffens have helped out by donating blog posts about the campaign. I really appreciate the support and their help in getting the message out. I’m asking you to help by considering a donation of $100, $50, or $25 dollars, or hosting a house party or fundraiser. You can also help by inviting people to the facebook page, sharing this post on your wall, or if it was emailed to you, sending it out to 10 friends and encouraging them to get involved. Thanks for your help. Together we can win this thing and start building a stronger Shelby County. Today was a pretty big day around here. First, it was Fat Tuesday, which means Ellyn, Frances and I do our annual feast of cajun food, followed by a parade around the house with family and friends playing various instruments. In reality, this just making a lot of racket and having a good time, but its become a tradition over the years and its something that I look forward to as we begin the Lenten season. It was also the first day of early voting at satellite locations. Ellyn and I always vote early. Most of the time there isn’t a line, and if there is its short. Also, I believe its important to take advantage of opportunities like early voting. For the first 10 years of my voting life I didn’t have it. I really appreciate the convenience of early voting, and want to take advantage of it to ensure it doesn’t get further curtailed in the future. Yesterday after work, Ellyn, Frances and I met at Mississippi Blvd. Church to do our civic duty. We checked in with the polling officials and Frances proudly announced that we were here to vote for her daddy. Frances and I went to one of the machines to vote. She wanted to see my name on the ballot. It was pretty neat holding her in my arms so she could see the voting screen and showing her my name on the ballot. She looked up at me, pointed at the screen and said, “That’s my Steve-o”. I reached out, touched the screen, and finished voting. The poll workers gave Frances some “I voted” stickers and we made our way home to start on our feast. Afterwards, we got out some instruments and started getting ready for our parade. We were joined by Auntie and Dave-o (all the guys have names that end in “O” around here except uncle). We had a great time. Looks like I may have a budding trumpet player on my hands here. 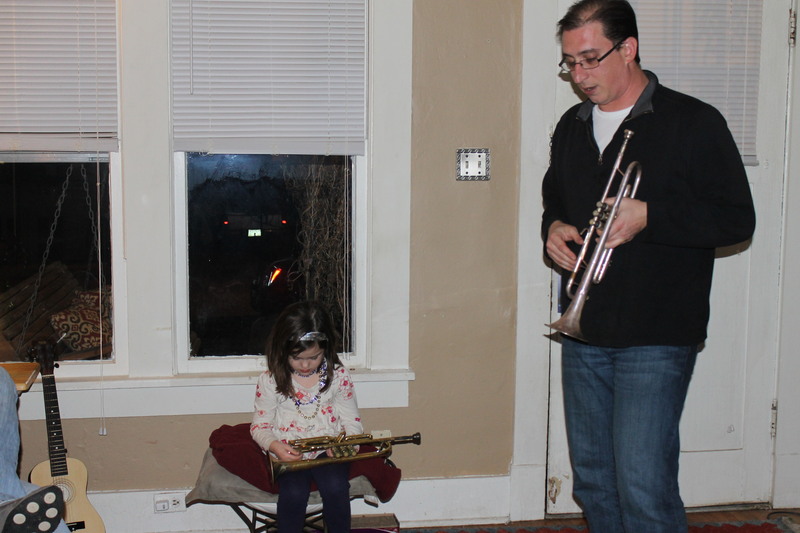 Watch out Memphis Horns, once Frances gets big enough to handle that big ole trumpet, I think we can give you a run for your money. Early voting continues through February 28th at these locations. Get out and exercise your right to vote. Note:Ellyn took all the pictures. We’ve got to find someone else for that duty so she can be included in future photos.